How profitable is your marketing? Only 38% of companies calculate marketing ROI and can answer this question. Let’s discuss what the best marketing KPIs are, how to calculate them, and how to align marketing with a company’s strategy. Marketing Scorecard online - sign-up with a free account for immediate access to 16 scorecard templates. Leads are moving along the marketing funnel. To measure this we need to have internal marketing metrics (see the examples of the KPIs below). Many companies (23% according to the Lenskold research) stop here, but if we want marketing to be really accountable, then we need to continue. By using internal metrics we confirm that we are doing things in the right way, but we also need to understand if marketing is actually doing right things, e.g. helping business to generate more revenue! According to the data from the above mentioned Lenskold research only 38% of the companies use some profitability metrics (ROI or NPV). What kind of problem is here? Why are some companies able to track their ROI while other treat marketing activities as something intangible and impossible to measure? Long time periods between initial contact with the prospect and sale. Case A: A company is selling a $29.99 product on the website. Most of the purchases are impulsive and are done within 15 minutes after the visitor is on the landing page. Traffic is coming from a Pay per Click campaign. Case B: A company is using a website to market and sell expensive products. They also participate in the conferences and trade shows, send out press releases, and are doing ads on local radio. In the Case A one can easily have a profitability estimation. While in the Case B it is possible only by using a disciplined approach to the measurement. 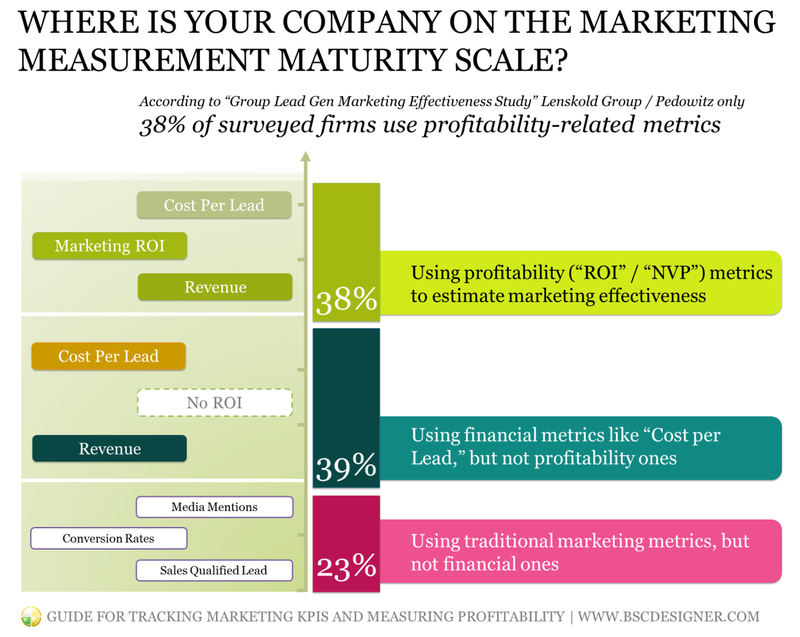 Measuring marketing ROI is a tough task, but many companies solve it successfully. A good starting point for this is to dedicate 5-10% of the marketing budget on the controlled experiments targeted on the various marketing methods. The problem is not with finding right metrics for the activity; it’s about the activity that should be measurable by design. Let’s take a trade show as an example. What can a company do to find out the ROI in this case? The investment part is clear, but what about tracking the revenue generated? Option 1. The company is trying to calculate ROI afterwards by tracking the increase in sales. Option 2. The company puts into their CRM all the business cards, emails, and badges scanned on the trade show so that in the future they can attribute closed sales to this event. Option 3. The company suggested that all visitors of their booth conduct a free self-assessment using an iPad app. The chances to track the lead are much higher for options 2 and 3. Moreover, with option 3 a company is generating excellent leads for sales! Think about the way to track something before you actually do it. The cost of processing unsuccessful leads. The conclusion is simple – we need both KPIs for the internal processes and profitability KPIs to ensure that the marketing helps a company to move into the right direction. To present profitability indicators and what is more important, the marketing strategy, we can use a strategy map. It is obvious that this model is not straight. A lead might be disqualified, or might be loyal to the brand in terms of social network engagement, but not ready to buy. Here are the most used metrics. If it makes sense in your business context add, as well “Marketing Expense per Employee” and “Marketing Expense as a Percentage of Revenue,” here you’ll need some historical benchmarks to get use out of this data. From the practical view point only Customer retention is a hard indicator of loyalty as customers are actually voting for your product by prolonging their subscriptions. Some time ago I was writing about indicators for digital marketing, so I’ll focus here only on the most important ones. Before checking out GA panel I’d recommend to start with the formulation of the questions that you want to ask. You might want to track mobile usability, or conversion rates into the certain goals, or the percentage of the referral traffic, or the percentage of Spanish speaking users if you need to justify the localization of the website. Practice shows that delivery and unsubscribe rates are more or less stable and due to their lagging nature do not generate many insights. Tracking open rate might be a great idea when you are testing marketing message (=subject line). Conversion rate might be an inexpensive way to track how your loyal auditory reacts on some new offer. Here is an example that might work as a template for your own project. I’m going to review the goals within four perspectives. 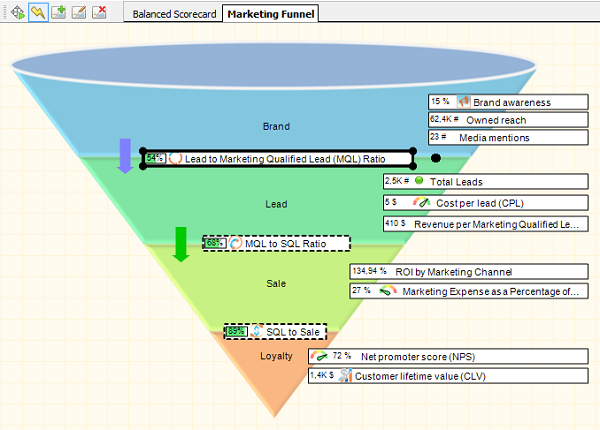 Here we have a generic goal “Increase revenue,” which in this example can be achieved by Generating sales qualified lead (SQL) (with “The number of Sales qualified lead (SQL)” as a lagging indicator) and Controlling marketing costs (with “Cost of Customer Acquisition (COCA)” as a lagging indicator). My choice of these two indicators imply that the strategy will be focused on developing long term relationship with customer. For example, the first product a company sells might generate no profit, but will establish certain level of trust between a company and a client that will result in revenue increase in the long term. A real strategy is always tailor made, so I’m not suggesting for all companies to follow this very strategy and use these very indicators. “Marketing qualified leads (MQL)” as a lagging indicator for the same goal. In this way we are focusing our search on the marketing tools that will allow interact with the customer long enough (measured by bounce rate) to deliver our message, and track the results by MQL metric. As for the goal of lead generation optimization, then we can obviously focus on the lagging indicator “Cost per lead (CPL),” and another lagging indicator “MQL to SQL Ratio” to track the leads’ quality. As for the leading indicators in this case, they should be related to the adjustments that we plan to test. “Analysis of customer loyalty” to learn in the details preference of the prospects. For example, the analysis of loyalty might show the areas where a company already has a good relationship with customer, but is not able to convert the customer into the MQL because of it is not clear how the product can solve a customer’s problem. To find such areas we can use “Net Promoter Score” and “Returning visitors” metrics. The last, but not least: show on the strategy map how the goals are contributing to the company’s overall strategy, align specific actions plan, and assign a person’s responsible for the goal. 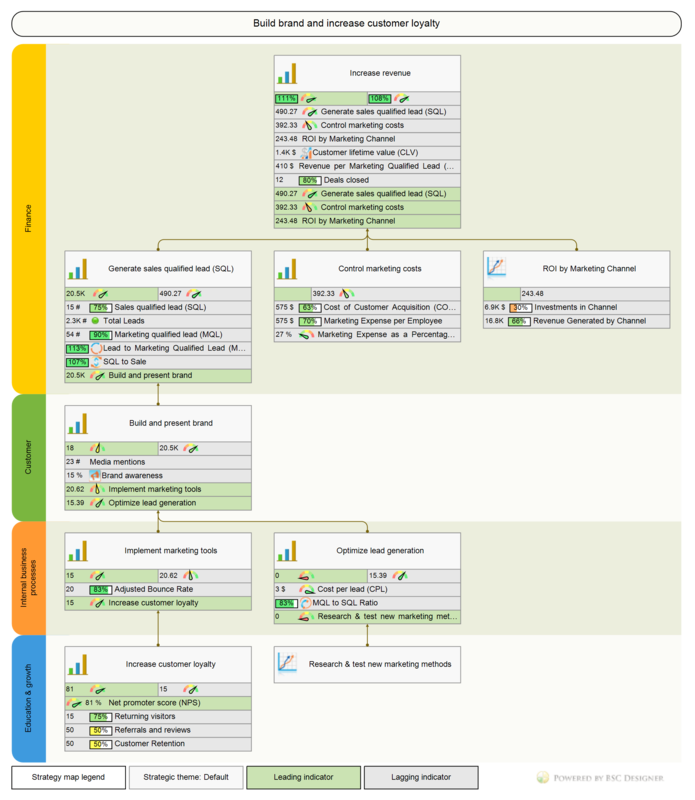 You can learn more about building strategy maps from the previously published article. 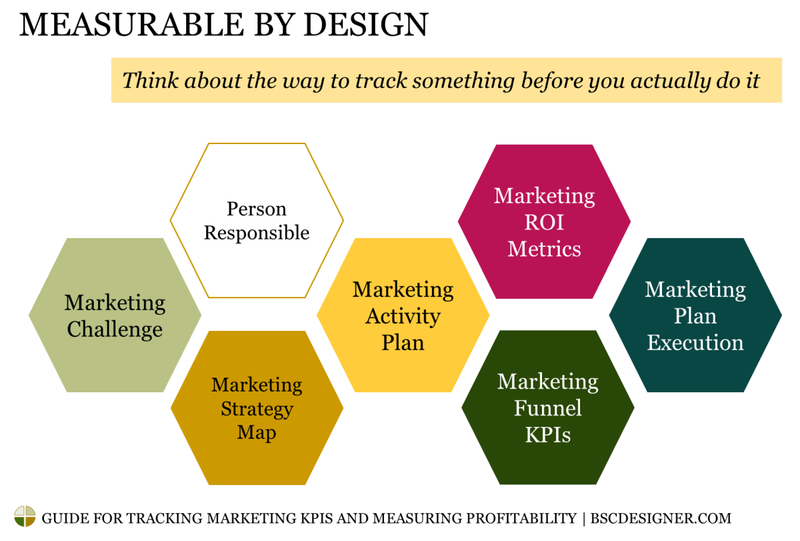 Create marketing strategy map to ensure that marketing efforts fit a company’s strategy. Feel free to share in the comments your thoughts, and the best practices about measuring marketing. 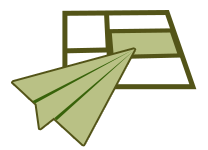 Marketing Scorecard discussed in this article as a starting template for your own scorecard!